Dutch violinist Emma Rhebergen graduated with her masters degree in June 2018 from Maastricht Conservatory under the guidance of Yuzuko Horigome. Following the beginning of her violin studies at the age of five, she attended the School for Young Talent at the Royal Conservatory in The Hague and studied with Koosje van Haeringen. She continued her studies in The Hague and obtained her bachelors degree with special distiction in the class of Vera Beths. Having learned the majority of the solo repertoire for violin, chamber music has always been of special interest to Emma. As a result, she has performed in various high profile programs which took place in esteemed halls such as the Concertgebouw Amsterdam (small hall) and Jurriaanse hall in The Doelen. In addition, she has also participated in festivals such as the International Chamber Music Festival in Utrecht, Grachtenfestival Amsterdam and the Orlando Festival. She is part of the Chekhov piano trio, the Metis String Quartet and she is also part of a dynamic violin-piano duo with pianist Michelle Chow. 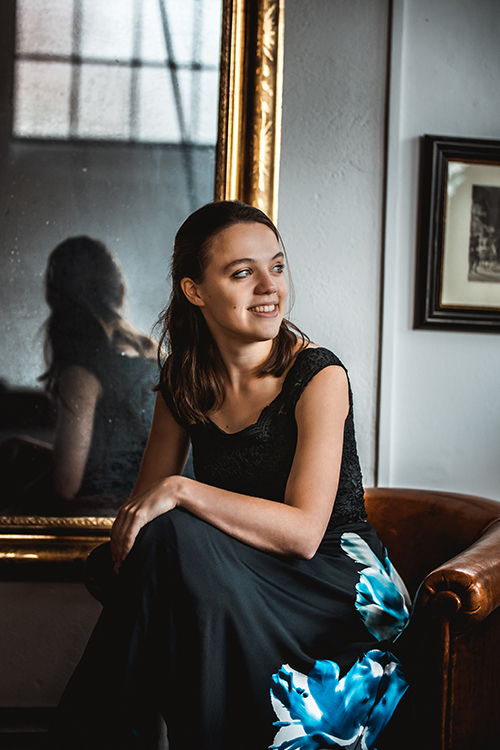 She has won first prizes during different national competitions including the Princess Christina Competition and the competition of the International Chamber Music Festival in Hoorn. In 2016, she was a finalist with her string quartet in the competition “Big Chambermusic Prize” in Rotterdam and was twice a semi-finalist of the Violin Competition Oskar Back (2016 and 2018) in the Netherlands. With Chekhov trio she won the second prize during the International Music Competion Triomphe de l’art 2018 in Brussels, Belgium. Emma has also vigorously pursued larger ensemble work as a member of various orchestras from a young age, garnering experience as a tutti member, principal leader, and a concertmaster. During her studies, she was concertmaster of the National Youth Orchestra of the Netherlands (NJO) and she is now a member of the Dutch string orchestra Ciconia Consort, where she is principal of the second violin section. As a soloist with orchestra, Emma has appeared with the works of Vivaldi, Bach, Mozart, Schumann, Shostakovich and Weill.